Meanwhile in the City of Lakes..
May your quest for good food lead you to the most unusual of places, like it lead this little guy. Ice Cream Cake In Bangalore! 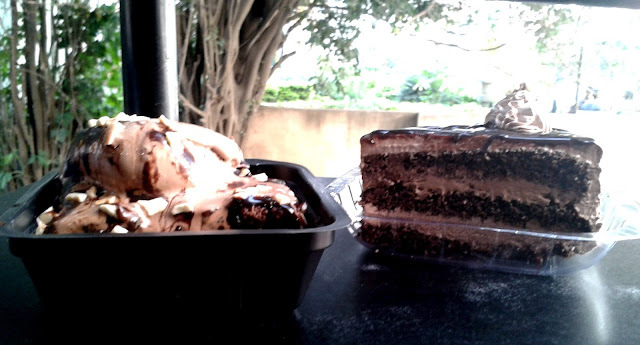 A lot of people showed interest in my recent Whatsapp display picture, an ice cream cake I finally managed to find in Bangalore. This quest goes back to 2012 when the aforementioned dessert took up quite a bit of screen space in an episode of Modern Family. 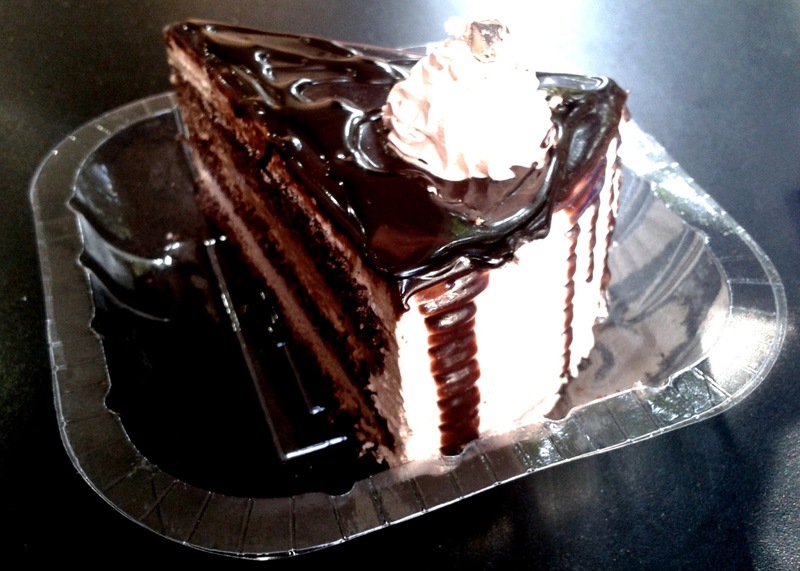 And as luck would have it, Manee and I happened to walk right into a place that has a pretty good version of ice cream cake. 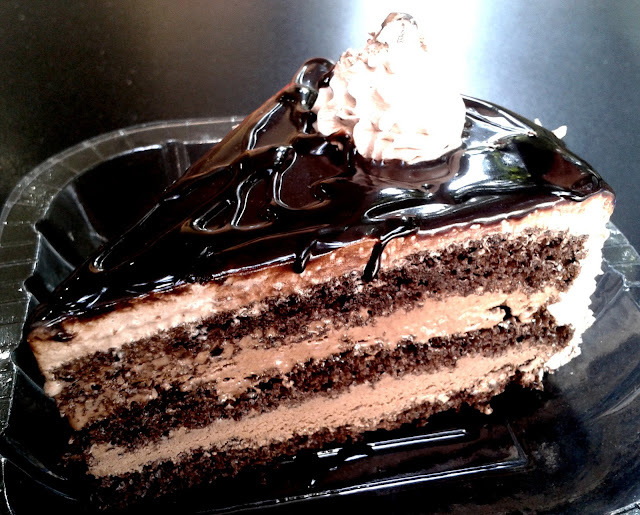 Behold Exhibit A from Bella Mooz, Church Street. First, hear me sing about the ambiance. The eatery has about 4 tables, two of them located in a balcony with a lovely view (again, it’s Church Street we’re talking about). The tables outside look into a garden and for once, the noise gets cancelled out. I’ve seen very few people here for some reason. 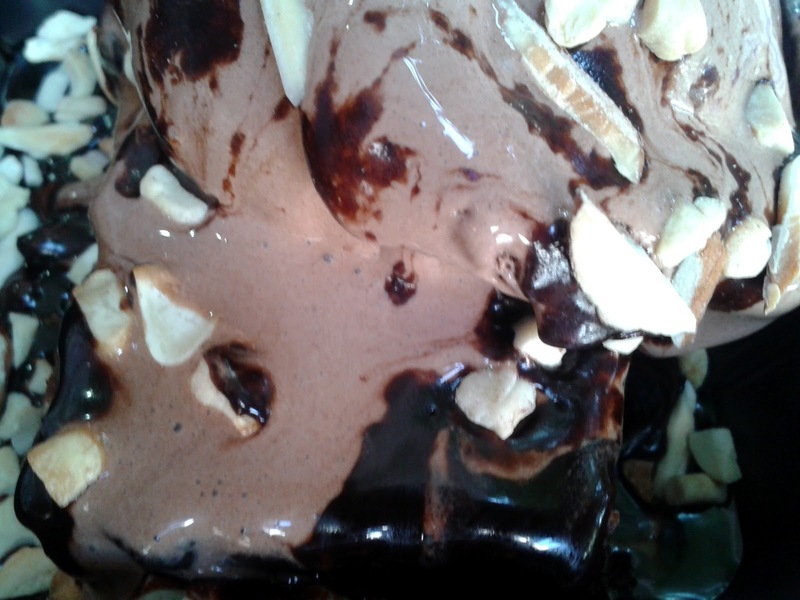 It’s a good place: the menu is fairly creative (try Baked Alaska), the ice creams rich and the smoothies perfectly made. Manee had a random chocolate sundae with a rather sticky sauce while I settled down with the hero of this post. Firstly, it is layered really well. Three layers of very thin cake and ice cream are nearly impossible to be held together by themselves, let alone be cut into pieces. The looks of the cake don’t really kill but it has so much ice cream that the chocolate cake gets lost somewhere amidst its layers. It’s the sort of dessert you’d want to take your time with. I know I know ice cream cake and all that but let it melt a little, almost to a sundae-like consistency and it will taste better. Make sure you take some extra chocolate sauce with it. 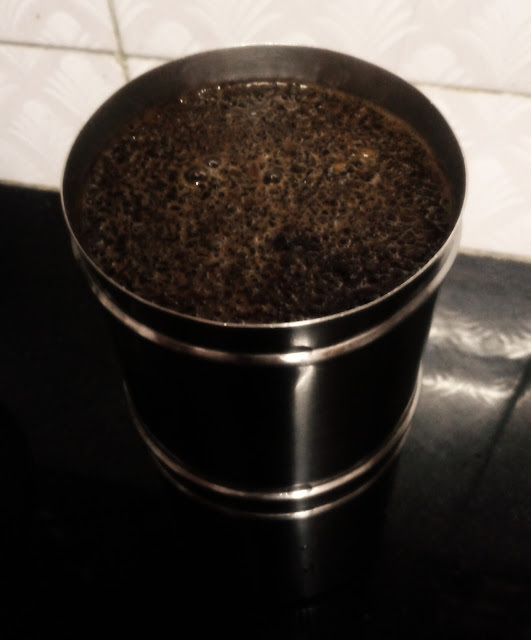 This post is an attempt to teach the quintessential lazy bum the art of brewing a quick half-decent (if not great) cup tumbler of filter coffee. Let us start with the primary apparatus and ingredients. 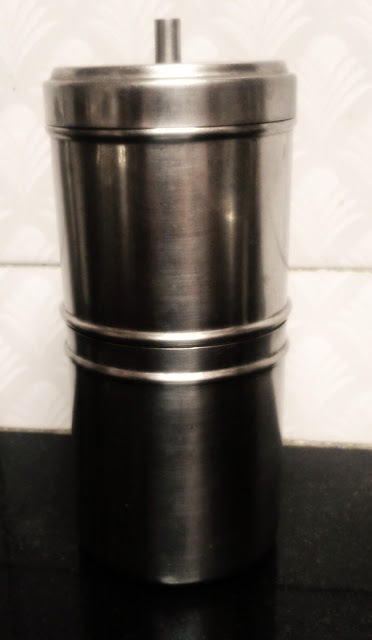 This two-tiered marvel of a metal sieve is an essential in every South Indian household. You can purchase one in most shops that sell steel utensils, coffee powder, or at select Café Coffee Day outlets (they also stock cappuccino machines and my birthday is on 13th Jan). In the absence of a filter, a cheat is to use the separation method of decantation from a primary school science textbook. As you probably guessed, this is the core ingredient for that strong, flavourful cup of brown and has to be of the non-instant variety that is insoluble in water. The alternative to grinding coffee beans at home is to get it freshly packed from a store that deals in coffee, tea, and/or spices. Cities like Bangalore, Mysore, Chennai, Hyderabad and Mumbai have a number of such stores which are usually named on the lines of ‘XYZ Coffee Works’. They have a variety of blends but I recommend the 85:15 (Coffee: Chicory, the latter enhances the taste of the brew). That’s what most Darshini hotels in Bangalore use and they usually have fantastic filter coffee. 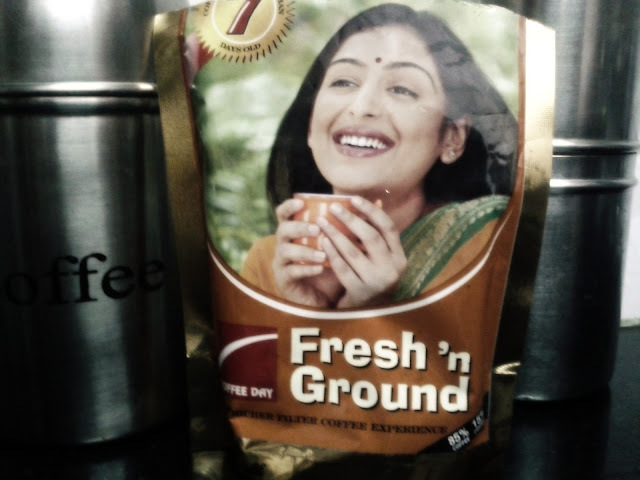 A good place in Bangalore to buy coffee is from one of the Fresh n' Ground outlets (that’s how CCD started way back in the 90s) and a freshly packed version of their coffee is supplied every week to More supermarkets. The first step is to prepare a decoction. Clean the filter and fill one fourth of it with your coffee. Now, pour boiling water all the way up. Care should be taken to pour the water in such a way that it covers and moistens all of the coffee without the need for stirring. Never stir the decoction in the filter else fine granules of coffee will fall through the sieve. Close the lid of the filter immediately while being extremely careful to not burn your hands. Leave the filter aside for a few minutes till the decoction is gathered. Now to the coffee itself. The measure used in my house is a 150 ml cup with a milk:decoction ratio of 3:1 and a teaspoon of sugar. Mix the contents well and then boil the mixture. 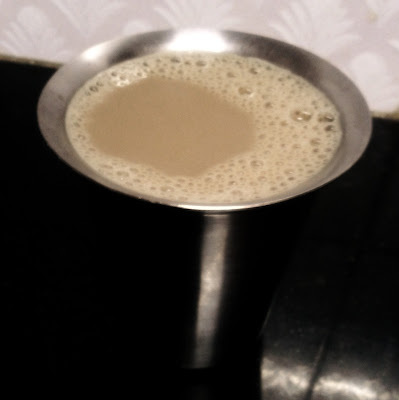 It tastes best when the decoction is fresh and the sugar is mixed into the milk before adding the coffee. Allow it to bubble along the sides and take it off the heat. Perfect for a winter morning. This Christmas, let us resolve to extend more care towards what we feed our toddlers. Us vegetarians are not exactly spoilt for choice when it comes to continental dining, even within the territorial limits of India. If a grass-eater wanted to relish (authentic or comparable) American cuisine in Bengaluru, he would probably have two princely options namely mashed potato and mashed potato with peas. Quite obviously disappointed, I began looking for a decent-enough veggie version of the burger that would brighten weekends. One place blew my mind away- The Only Place. This is not a restaurant review of The Only Place..that has been said and done by every other techie who assumed he discovered the best steakhouse in the country. What this post tries to do is recollect Marshall Erikson's speech about a heavenly burger, and proceed to elaborate on the difference such a burger can make to one's day. 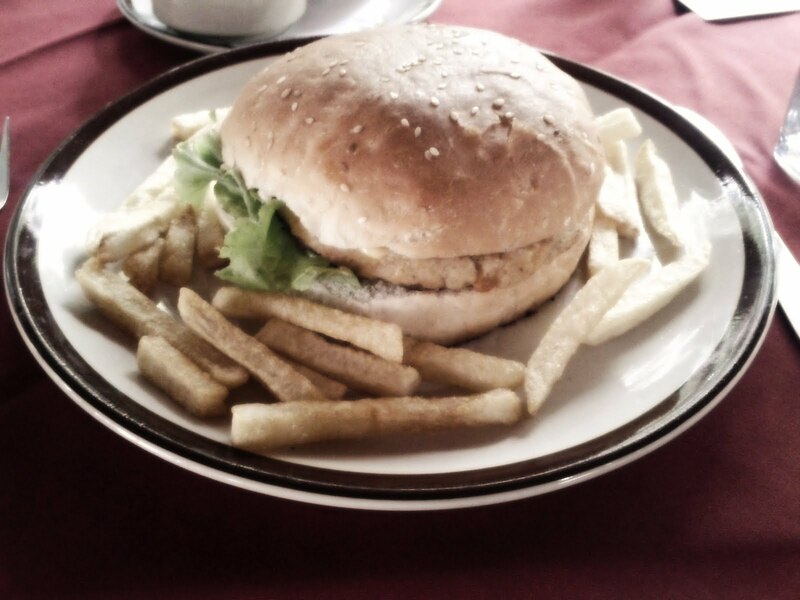 The burger in question is the humble vegetable burger in the establishment's menu..served with cheese or without. Do not go by the picture below as it looks much better 'in person'. Before you proceed to polish off the bun and its patty, get yourself an iced tea and a portion of cheese garlic bread..this is a must at The Only Place and I guarantee it will be like no other cheese garlic bread you have had- more cheese than bread, literally. Post that, devour the home made french fries that come with your burger: use the sharp, authentic mustard to dip. Why must you do as I say, you wonder. Food that has been strongly recommended will surpass every level of awesome only if you attack it with great expectation. Of course, it can also backfire but I assure you that will not be the case here. Expectation now built, you hold the warm, HUGE burger and bite into it. The bun is soft, moist and uncrumbly (hear that, KFC? ), the patty large enough to droop outside the bun (hear that, McD? ), a slice of tomato, excellent cheese, perfectly flavored..this burger is every vegetarian's delight. Size-wise, it is comparable to two McVeggies which implies I generally skip dinner after making this a late lunch. It even manages to push Mysore's Downtown burger to a far second, not considering the ambiance and pricing. At 110-120 INR, TOP's veggie burger is the best I've had in the city, in comparable/less fancy ambience. Finish it off with a cherry pie and don't scrimp on the ice cream. I have decided against elaborating on the difference such a meal can make to one's day. Open. Eat. 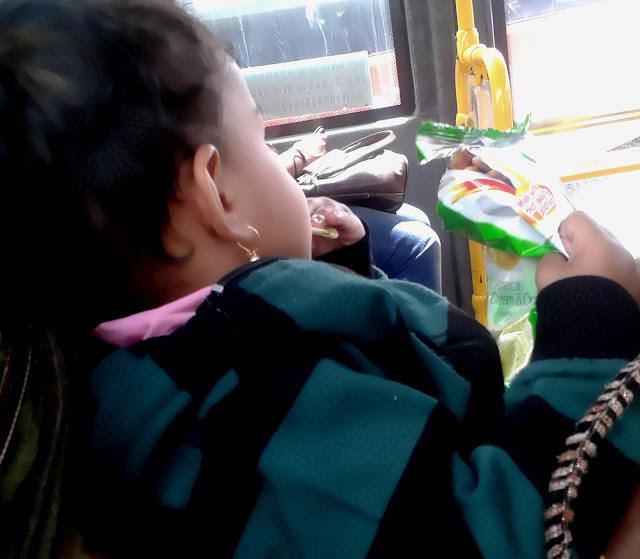 by Akshatha Hegde is licensed under a Creative Commons Attribution-NonCommercial-ShareAlike 3.0 Unported License. Based on a work at www.open-eat.com. This blog solely features non-sponsored individual opinion. If you are associated with any product reviewed here and do not like what you read, kindly consider it constructive criticism.